We want your feedback on our eLearning content! All eLearning in the ComplianceServe library undergoes a thorough review by our subject matter experts and learning designers on a regular basis, to ensure it reflects the appropriate regulations and best practice guidance, and features up to date case studies. 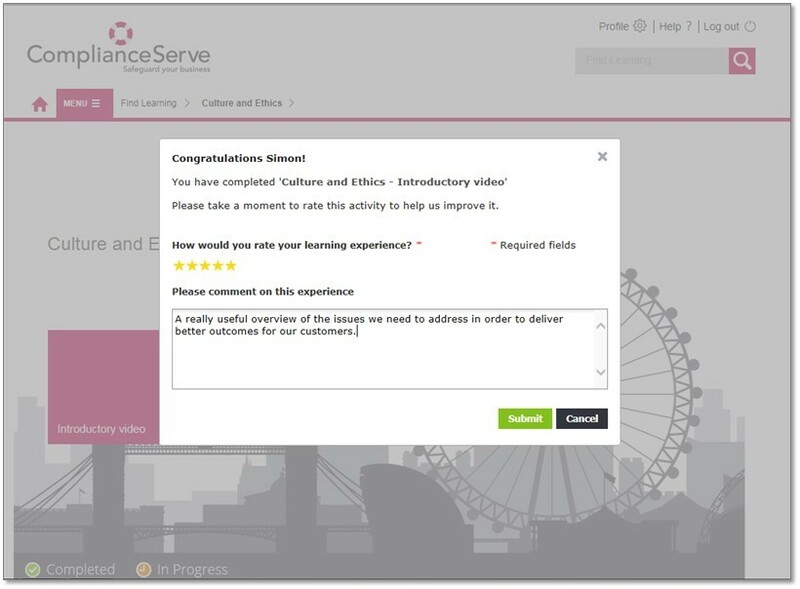 To take things a step further, we have enabled a new feature in ComplianceServe – Activity Ratings - so that learners can rate and provide feedback on individual learning activities. Upon completion of each activity within a pathway, learners will be presented with the option to give the activity a star rating (from 1 to 5) and enter comments. These will be reviewed by the ComplianceServe team and considered as part of the ongoing review process to ensure our content continues to deliver a great learning experience whilst meeting the regulatory requirements. Activity Ratings is now live on www.complianceserve.com and http://compliance.skillsserve.com.